Wrestling isn’t fake because it’s not real. That’s never been an easy idea for the sports entertainment skeptic to swallow, and eyes will surely roll if you describe it as the combination of dance, magic, and live theater that it truly is. Still, the wrestling fan has always known that the thrill is in the not-knowing. How real is the promo? The piledriver? The character? Time and again, it’s proven to be harder to grasp than one might think. They call it kayfabe, the insistence that what you’re seeing is real, and, though the illusion has most certainly faded with the transparency afforded by technology, the blurry line between what’s true and what’s fiction remains a selling point. It’s also at the core of Viceland’s Dark Side Of The Ring, a six-part docuseries that takes an investigative approach to some of wrestling’s most whispered-about scandals and tragedies. Take its episode on the infamous Montreal Screwjob, a lightning rod in which WWE CEO Vince McMahon and his cronies covertly manipulated the pre-determined outcome of a 1997 match between Shawn Michaels and Bret Hart, the latter of whom was on the verge of leaving for competing federation WCW. Dissection of it continues to this day, and Dark Side Of The Ring, like many before it, correctly posits the incident as the moment when wrestling’s fourth wall collapsed. Director Jason Eisener, though, is clearly a fan, one who understands that all shoots (industry terminology for unscripted events) eventually become works (scripted moments written to seem unscripted). By incorporating a slew of eyewitness and adjacent accounts—Hart; WCW president Eric Bischoff; nWo founder Scott Hall; referee Earl Hebner; and industry titan Jim Cornette; among many others—Eisener folds in enough competing accounts to render the event, which evolved into its own storyline in the ensuing years, more opaque than fans might believe. As Jake “The Snake” Roberts intones in a separate episode, the world of wrestling is a world of stories. Nobody in the business can be trusted. That theme carries through several of the episodes. The mysterious 1986 death of “Gorgeous” Gino Hernandez, for example, became intertwined with the feuds he had in the ring. The tragic tale of Texas’ Von Erich wrestling dynasty, meanwhile, was impacted and exacerbated by the family’s reputation as god-fearing good ‘ol boys. In the series’ best episode, the investigation into the 1988 murder of Bruiser Brody is muddied when those allegedly responsible exploited his vicious in-ring persona to claim self-defense. The truth is elusive in wrestling, especially in an era when kayfabe was valued above all else. In one striking, unsettling bit of vintage footage, Brody (né Frank Goodish) bristles at realizing an “earnest” moment was caught on camera. “People shouldn’t know Frank Goodish,” he tells the intimidated interviewer. And then there’s the troubled relationship between Randy “Macho Man” Savage and “Miss” Elizabeth Hulette, which unfolds in Dark Side Of The Ring’s captivating first episode. It’s no secret that the pair’s onscreen wedding at the 1991 Summerslam went down as their real-life marriage, which had been consummated seven years previous, was on the verge of collapse. To hear from those in their orbit, though, is to learn that, for years, the strife between them in promos was rooted in their real-life issues. If this is what was manifesting onscreen, what was happening behind closed doors? It’s a scary question that gets a handful of different answers. Still, the myriad accounts never quite dovetail. They don’t in a number of these episodes, especially in the series’ gutting dig into the allegations of exploitation against women’s wrestling trailblazer Fabulous Moolah, who’s been accused of abuses both sexual and financial by her former students. That might prove frustrating to those who crave simple, solvable narratives, but Eisener gives a voice to all of his subjects, all of whom have earned their right to speak on the topics at hand. There’s only a few secondhand critics here, with Eisener almost always favoring firsthand accounts. That results, of course, in unreliable narrators like Cornette and wrestlers like Roberts and Hall, who, by virtue of spending their whole lives in the business, have more or less morphed into their characters. Their expertise, however, is undeniable. These people live the business, which, in wrestling’s strange, amorphous way, makes them as informed as they are untrustworthy. And therein lies what’s so compelling. Sometimes, it genuinely feels as if the viewer is being worked, as if the industry vets featured here are doing what they can to keep the ambiguities at the heart of their livelihood as obfuscated as they once were. In that sense, it’s as thrilling as a live wrestling show, though it does lack sports entertainment’s visual fireworks. 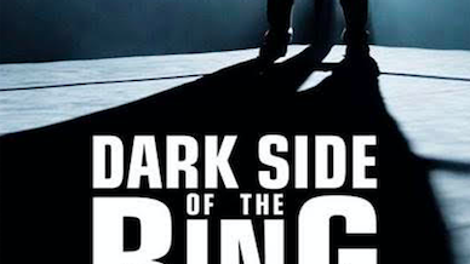 From a cinematic standpoint, Dark Side Of The Ring unfolds like nearly any Investigation Discovery mystery, with shadowy reenactments accompanying the talking heads prodding the narrative. It lacks dynamism in that way, though you can’t deny the power of its archival footage, much of which offers glimpses into past iterations of the industry that only barely resemble WWE’s polished product.